Here Andrew escorts his daughters to Charles & Camilla's wedding. They're such a handsome family. 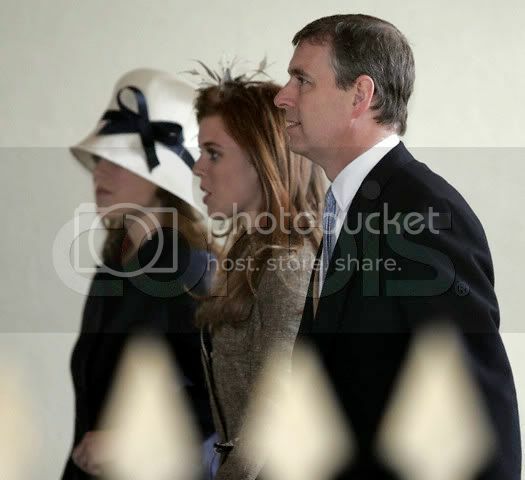 Second is a pic of Andrew, Sarah, and Beatrice at a memorial service for Sarah's father, Ronald Ferguson, in 2003. 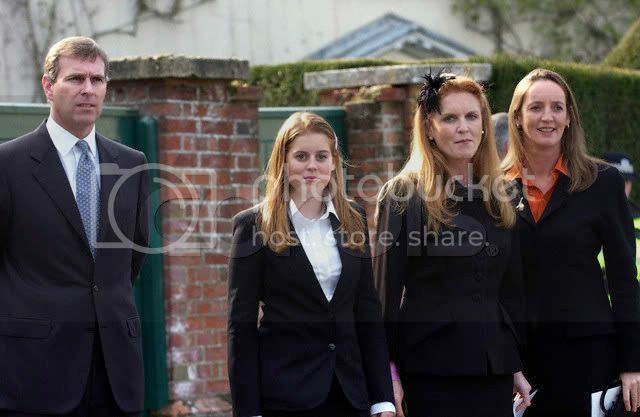 I really like the photo of Eugenie, Beatrice, and Andrew at Charles/Camilla's wedding. Thanks machievelli, its a stunning pic, isn't it? I like the fact that it shows the three of them in profile. It give it a timeless quality that you don't get from frontfacing shots. you can posted the link with the photo, please? I cant see the photo. Thanks, Iceflower. Did you read the article? Did it explain the caption "last" holiday? You are most welcome And yes, I did read it, it was said "last" as Bea and Eugenie were not expected to make any more holidays together with their parents, as to their age, simple speculations..
And as you can see these days, Bea actually is with her parents again during their skiing holidays..
"Prince Andrew, Sarah Ferguson, Duchess of York and Princess Beatrice on holiday in Verbier, Switzerland - 14 Feb 2007"
Thanks, Iceflower! It's nice that Andrew and Sarah can holiday together still. While I think it is very sweet that the Duke of York and the Duchess of York have maintained such a wonderful relationship since their divorce, I cannot help but be amused sometimes at what the future holds. If Andrew remarries, will Sarah lose her title? Will she still live with the family? If I were dating the Duke, I would have some misgivings about the set up of this situation. Also, as the children are much older now, I think it is time for Sarah to stop tagging along on skiing trips, etc.... It was always said she cared more about being a Royal than she did about Andrew, and frankly, she seems to enjoy the perks a little too much. Did anyone catch her on Letterman some time back when he asked how the girls were doing, and she said "Do you mean the Princessess?" I mean, COME ON. I admire that she dug herself out of debt, but isn't she set to release some tell-all book? That should win her votes with "The Firm". Anyway, on another note, the Princesses are beautiful and Andrew looks just wonderful as well. Thanks for the pictures, Iceflower! More pictures of Andrew, Sarah and Beatrice skying in Swtizerland. Gallery of pictures from Abaca. If Andrew remarries, will Sarah lose her title? No. She will remain Sarah, Duchess of York. She has always taken vacations with each daughter every year. It is not a perk. It is her way of giving them individual attention. Did anyone catch her on Letterman some time back when he asked how the girls were doing, and she said "Do you mean the Princessess?" This was her subtle way of saying that they are to be addressed as "princesses" and not girls. Whether it was rude or not, she wanted to make a point of that. All of this has been discussed before, so I'm just drawing from past information posted on previous threads. And I just proof read my post and it sounds a little snotty, and I don't mean for it to come off as such. So please to not take offense. I'm just short on time and wanted to get the post out. If that were true, it would contradict so, so many other things she has said, IMHO. Sarah is/will be Sarah, Duchess of York. Andrew's new wife would be 'Name', The Duchess of York. Andrew's wife would be HRH The Duchess of York. The HRH is the big difference, because Sarah lost hers when she divorced Andrew. I understand--the HRH coupled with The is a very big difference. That is the defining factor. I can see that. So, basically, if HRH Andrew, The Duke of York were to remarry, she would be, let's say just for fun, HRH Janet, The Duchess of York and Sarah would be Sarah, Duchess of York. The loss of the HRH and the The denotes that she has lost some serious ranking, correct? And, Sarah is now regarded as Sarah, Duchess of York and is no longer HRH Sarah, The Duchess of York or is she Sarah, The Duchess of York because she is the only one? I read somewhere that she was doing some charity thing and that she insisted on being referred to as "Ma'am" and "Your Grace" or "Her Grace"--any truth in that? So, not wanting to start any type of argument here and this is just for discussion sakes--Diana, upon her divorce lost the HRH and the The and became Diana, Princess of Wales. Now, would Charles' new wife have been referred to as, HRH Camilla, The Princess of Wales? As much as I like Camilla, that really does sound a little weird-but its her right to use, correct? And, thank you for the explanations! She is correctly, 'Sarah, Duchess of York' no The. Whether she ever said this I don't know but it would still be the correct form of address - she is Your Grace/Her Grace but no longer HRH. That would be, and technically is, the correct form of address minus the actual name - it is HRH The Princess of Wales - just as she is now using HRH The Duchess of Cornwall and Charles correct form is HRH The Prince of Wales - their names don't come into it as their is only one holding the real title, as opposed to the ex-title at any one time (Sarah, Duchess of York - indicates her divorced status). I think HRH The Duchess of York would sound nice on someone - so why not you?